One of my favorite parts about living in Israel is the incredible quality, low price, and seasonality of the produce. That and learning about new ingredients. It’s nearing the end of the time when we see Armenian cucumbers at the shuk, recognizable by their light green color and peach fuzz. I didn’t learn until recently that these sweet cucumbers aren’t cucumbers at all – they’re in the muskmelon family along with cantaloupe and honeydew (although these, I’ve learned, are more closely related to cucumbers than I could have imagined). Their slightly sweet, melon-like flavor should have tipped me off. Also called yard-long cucumbers and snake melons, I’ve heard that you can actually find these tasty fruits at farmers markets in the US. When you have a fun, fresh ingredient like this I tend to keep my preparations simple. I immediately whipped up a simple Greek salad-inspired Armenian cucumber salad with thinly sliced red onion, feta, olive oil, and red wine vinegar. This salad can easily be made with regular cucumbers as well, and makes an amazing side or even relish for grilled chicken. It would pair as naturally with Greek souvlaki as it would with couscous, and can easily be doubled or tripled to feed more people or turn it into a light lunch. For more Armenian cucumber inspiration check out Beth Michelle’s amazing looking Thai Chicken Cucumber Salad, and this one from the Kitchn. This salad is light and bright, perfect any time of year as a side or light lunch. Substitute Kirby or English cucumbers if the Armenian variety is not available. 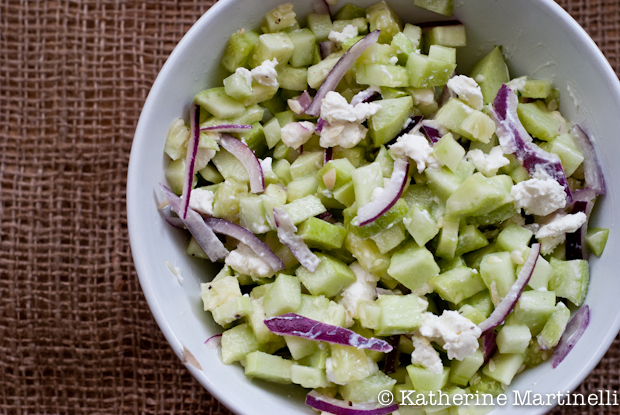 Put the cucumber, onion, feta, oil, and vinegar in a medium bowl. Serve! (This keeps well and marinates nicely covered in the refrigerator for up to 1 day or overnight). I’ve never heard of an Armenian cucumber, how cool! The salad looks great. This looks wonderful! I could eat a whole cucumber with nothing added, so your yummy salad would be hit! Fabulous cucumber salad and cucumber ideas too katherine. A very different kind of cucumber. A lovely salad. I left a cucumber cocktail of course…. 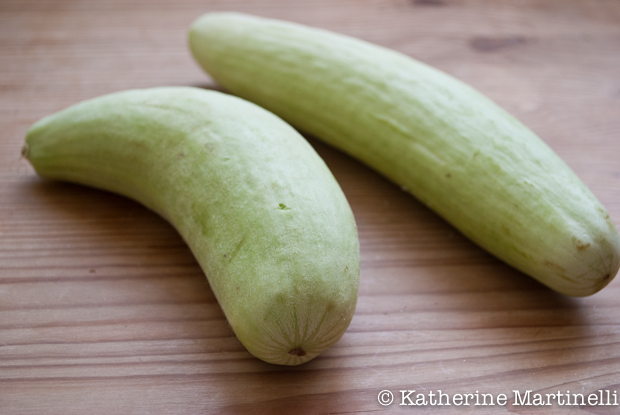 I’ve only had the privilege of eating a couple Armenian cucumbers and you’re right – they are SO GOOD! What a lovely, simple salad to accent their flavor! Great idea for a hop! Love cucumbers so I’ve linked up a couple of my recipes that highlight this tasty little veggie. Have a wonderful weekend and thanks for hosting! Nice! I bet these would also be fantastic in a smoothie 🙂 Kinda jealous right now! I love cucumber salads – so refreshing! This is basically a perfect summer salad. I love your salad! I just shared my Cucumber Raita which goes with my Tandoori Chicken Kabobs. Thanks for hosting another great blog hop! A sweet cucumber? I don’t think I’ve seen these before, but will keep an eye out for them. The salad looks wonderful! Another great link up. I still think it is so cool that you live in Israel! Looks great! Myst be delicious too! What nifty cucumbers. I’ve never seen an Armenian cucumber. Love this salad! This looks amazing Katherine. Mini-me is a cuke nut so she’d love this. I’d love to try Armenian cucumber! This looks delicious. It’s so easy to make too with red wine vinegar. I have all ingredients in my fridge right now except for Armenian cucumber… I love this kind of quick and tasty salad. Very lovely!! Katherine this salad looks so lite and refreshing. I have never seen this cucumber before but I do like the sound of it’s melony flavor. Congrats on Top 9. Wow, I’ve never seen these Armenian cucumbers before! I’ll have to keep my eyes open for them, but in the mean time I’ll try out this recipe with long English instead. Thanks for the recipe! Nice salad, and congratulations on making the foodbuzz Top 9! I love putting feta and cucumbers together like this, they are a perfect pair. Gosh, you can do so many great things with cucumbers! They’re great served alone (with vinegar and oil, or some kind of dressing), or fancied up in a salad – like this one! Really nice combo of flavors. I envy you all the great produce you’re getting! I love the theme of this blog hop, Katherine, and your recipe. I posted one with flavors you will recognize in your part of the world! This is one of my favorite Summer things to eat! YUM! I’m growing these in my garden, and they’re HUGE! About as big as my toddler (at at least as heavy)! I had no idea what it was I’d planted (I just saw “cucumber” and was happy to give it a try), and am so glad to find this recipe. Now I know what to make for dinner. Pingback: Our First First-Haul from Maya's Farm CSA - WTF, CSA?!? Thank you for this simple but delicious salad. I’m lucky to have a friend who grows Armenian cucumbers in her garden and shares her bounty! I did use balsamic vinegar which is my go to in many recipes.